PCMCIA support was not present (card.resource and carddisk.device are absent), and not needed, as the Walker didn't have a PCMCIA slot. exec.library was bumped to 43.4 (10.3.96) and displayed an alert message upon boot. expansion.library was bumped to 43.2 (10.3.96), probably adapted to acknowledge the Walker's FAST RAM. scsi.device was bumped to 40.20 (18.2.94), with some kind of large drive support. bootstrap bumped to 43.1 (8.3.96). Removal of the 2GB limit from FastFileSystem (and possibly beyond 4.3GB). A Japanese locale version of Workbench 3.1 (v41), with multi-byte character support which was never completed. 3.2 was supposed to use a new (two-chip) 1MB Kickstart ROM. Other bug fixes and small enhancements. Ignacio Gully notes that: "Whilst the Walker had provisions for a 1MB Kickstart, it in fact only used 512KB. It was based on a 3.1 ROM, and had some minor changes (noted in the "Enhancements" section above). Also, CDFS wasn't revamped and bug fixed to function with Scala and the new E-IDE interface (of the Walker). It is, in fact, the same as good old Workbench 3.1 CDFilesystem version 40.11." Luke at amigaplatform.com notes that he found a beta version of Workbench 3.2 (for developers only). Made by Escom AG, and apparently used on the Amiga Walker, the Kickstart version is 43.1B (dated March 10, 1996) on two ROM chips marked "U & L". The Workbench and Exec versions are 40.42 and 43.4 respectively. "The Audio system will be the best of any system out there." Closely-integrated 2D and 3D API are "already underway." 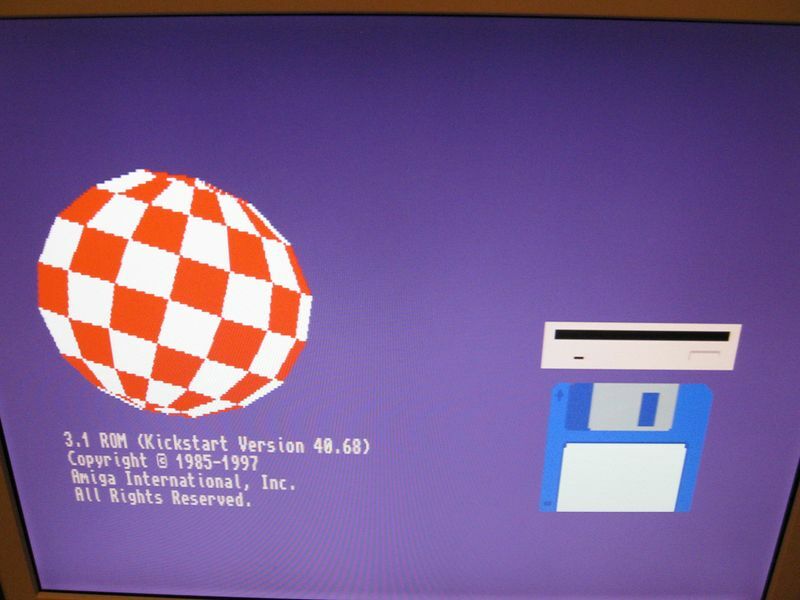 Joan Dow posted the following info on the official OS 3.5 mailing list regarding a post-3.1 Kickstart: "...it was a Kickstart past 3.1 without ANY built-in disk driver software, and in its place added some pretty much meaningless gewgaws like a fancy checkmark logo during the boot process. Given the way it escaped to me I will SHOW it to visitors but not give it to ANYONE." Within Amiga Technologies/Amiga International no real work was done on a true Workbench v3.2. Talk is cheap; Walker ran with a v3.1 Workbench with minor tweaks. The Walker contained a modified, mostly 3.1-based Kickstart ROM. Due to the hardware changes, a plain Amiga 1200 3.1 ROM would not have been working. The hardware, however, was prepared for a 1MB ROM. Toni was the system controller and did, for example, implement the DRAM interface. The FPGA used on the prototypes had a few frequency problems and were not completely stable at 33MHz. 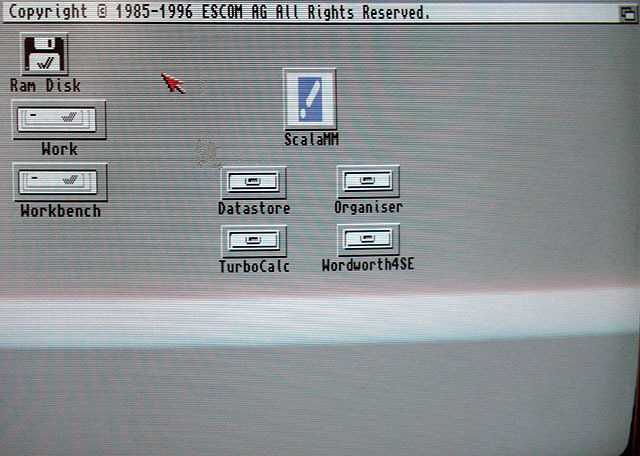 Later investigation showed that CeBIT would have been easier by running the machines at 25MHz. The motherboard contained a SuperIO chip and a Dallas Clock as major enhancements, aside from the "Toni" custom chip (really an FPGA). The original prototypes did not contain the Dallas clock due to some kind of hardware problem not found before CeBIT. No drivers were actually written for the new hardware. ESCOM died too fast. Several Walker units were built. The three Walker units shown at CeBIT were put into the "fancy" case. One other machine exists in a standard PC case, which wasn't a problem as the Walker was intentionally a Baby AT like design. The prototypes were brought up in less than a week before CeBIT and were run at 33MHz. Using a Coldfire was discussed for about a millisecond but the idea was dropped in another nanosecond due to basic Coldfire V2 68k compatibility issues. There never was a thought to use a 68040 in the base design and a 50MHz 68040 doesn't really exist anyway. The main discussion revolved around using a 33MHz '030 or a 40MHz EC '030. The decision was made against the MMU and for the higher speed even though (for the prototypes) chips with MMUs were used. WBN: Did Commodore ever have a Workbench 4.0 in beta? WBN: ...or was it basically 3.1? DH: That was it. At Amiga Technologies, there was interest in doing a "3.5" release, but this was really just a clean up of some of the 3.1 stuff, maybe with a few contracted pieces like the 64-bit file system and drivers. Nothing ground breaking. WBN: I ask, since there's an [old] magazine article that mentions it briefly. DH: It's nonsense, far as I can tell. Certainly, Amiga, Inc. can release any AmigaOS they like and call it 4.0 or 15.7690 or "Theodore" if they want to. But there was nothing approaching what a real 4.0 would have been; no work even started on it (it would have been the OS released for AAA support, but AAA was cancelled before this started, and most of the critical people left within six months of that as well). Simon Goodwin adds some Walker background: "There was some work done on making the Walker use a Coldfire MCF5102 (cut-down 68EC040 CPU), but the cost of the bus interface (from 68040 to 68020) cycles were higher than the cost of the chip, so they went for the best 68040 that came cheap—the 40MHz ones found in the course of sifting out 50MHz ones for premium price—and the minimum of Lego. A less-than $20 20MHz MCF5102 should be twice as fast as the 68EC030/68EC40 on an efficient bus." Holger Kruse posted on comp.sys.amiga.misc on September 11, 1999: "V41 was reserved for the Japanese locale version of Workbench 3.1, with multi-byte character support which, as far as I know, was never completed." Heinz Wrobel corrects Holger Kruse's earlier comments in regards to v42: "v42 was not used for stuff done by/for Amiga Technologies/Amiga International. v43 is the number." Holger's earlier comments read as follows: "V42 was used for a few modules of an internal WB 3.2 alpha version, consisting, among other things, of some new and updated shell commands ("list" with sort function, "owner" etc. ), which were eventually distributed with Envoy. This happened in the first half of 1993, i.e. before Commodore died and long before Amiga Technologies took over. Amiga Technologies later continued to use the version number v42 for its own stuff though (Setpatch, etc.)." Two of the several Walker units produced now reside in Petro Tyschtschenko's office.